WADSWORTH, KHUSNUTDINOVA, AND MOORE PUBLISH IN JOURNAL OF MATERIALS CHEMISTRY A THEMED ISSUE ON EMERGING INVESTIGATORS. Each contributor was recommended by experts in their fields as carrying out work with the potential to influence future directions in materials chemistry. ​Wadsworth, et al., J. Mater. Chem. A. 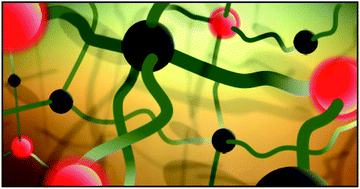 WORK BY KHUSNUTDINOVA, WADSWORTH, AND CO-AUTHORS GRACES COVER OF ACS CATALYSIS. ​The cover art illustrates the molecular structure of the reported catalyst, a binuclear copper(II) fused porphyrin, and the union of two protons to synthesize the chemical product, hydrogen. Under appropriate conditions, a single molecule of the catalyst produces more than 2,000,000 molecules of hydrogen per second (a rate constant among the highest reported in the literature). This work explores the concept of leveraging extended aromaticity as a strategy for breaking unfavorable scaling relationships associated with multi-proton multi-electron redox catalysis and providing an alternative to use of electron withdrawing or donating substituents to favor electron transfer at reduced bias potentials while unfavorably altering kinetics of associated proton transfer steps. ASU SCHOLARS, STUDENTS, EMBEDDED IN INDIGENOUS COMMUNITIES WITH RESEARCH IN INDIGENOUS COMMUNITIES. 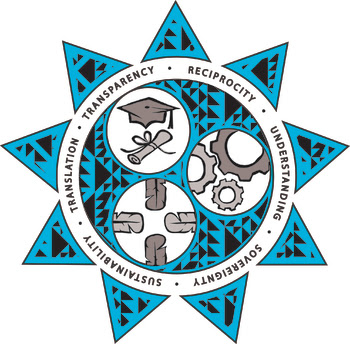 ASU has a wide breadth of research and interactions taking place in Indian Country. Health care, language preservation, molecular sciences, sustainability, research methodologies, and higher education experiences were among the topics discussed at the 2018 Doing Research in Indigenous Communities Conference. ODELLA, MORA, WADSWORTH, AND CO-AUTHORS PUBLISH IN JACS. The article, titled: Controlling Proton-Coupled Electron Transfer in Bioinspired Artificial Photosynthetic Relays, reports on Bioinspired constructs consisting of benzimidazole-phenol moieties bearing N-phenylimines as proton-accepting substituents designed to mimic the H-bond network associated with the TyrZ-His190 redox relay in photosystem II. In these constructs, the extent of proton translocation along the H-bond network, either ∼1.6 Å or ∼6.4 Å, can be controlled through imine substitution. WORK BY KHUSNUTDINOVA AND CO-AUTHORS FEATURED ON JOURNAL OF PORPHYRINS AND PHTHALOCYANINES COVER. The article, titled: Vibrational structure analysis ​of cobalt fluoro-porphyrin surface coatings on gallium phosphide, demonstrates the use of GATR–FTIR spectroscopy as a sensitive tool for characterizing porphyrin-modified surfaces with absorption signals that are close to the detection limits of many common spectroscopic techniques. MOORE IS NAMED AS ONE OF THREE ARCS FOUNDATION DOCTORAL ADVISORS RECOGNIZED AS EXCEPTIONAL MENTORS. SAFE SUSTAINABLE SCIENCE EARNS ASU RESEARCHER PRAISE. 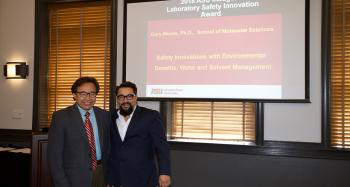 Moore (right) accepts the Laboratory Safety Innovation Award from Professor Jingyue Liu, chair of the safety and outreach subcommittee of the University Laboratory Safety Committee. Moore’s work to both conserve water and increase safety earned him and his group the inaugural award. Ardo, et al., Energy Environ. Sci. ​PATHWAYS TO ELECTROCHEMICAL SOLAR-HYDROGEN TECHNOLOGIES. 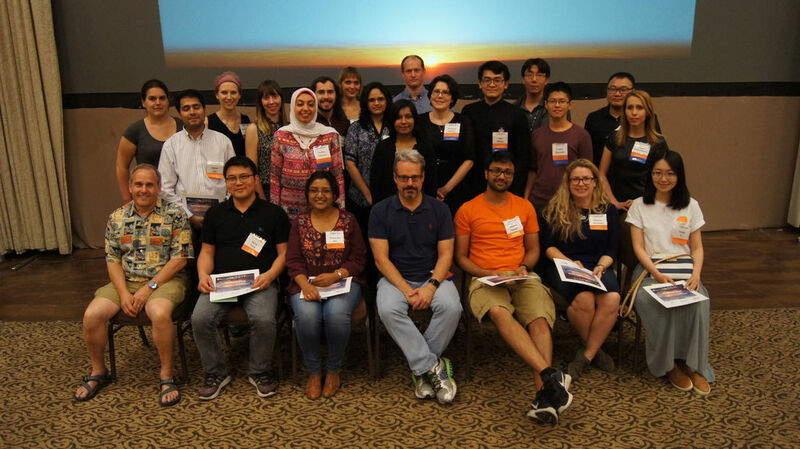 This article condenses the perspectives of ~50 basic scientists, engineers, and social scientists, from academia, government, and industry, and reports on high-potential pathways for commercialization opportunities of solar-hydrogen technologies. By doing so, the article identifies key barriers for the deployment of these technologies both in the short term and long term. The insights provided in this perspective paper intend to contribute to defining new directions for research in the solar fuels field, and to enable future solar-hydrogen ventures that capitalize on technical advances from the scientific community. 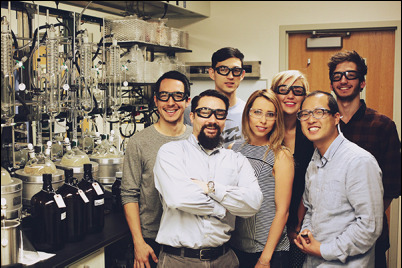 BEILER AND COWORKERS PUBLISH IN INORGANIC CHEMISTRY. The article describes how thin-film polypyridyl surface coatings can be used to assemble cobalt porphyrin catalysts for hydrogen production onto a a gallium phosphide semiconductor. Key features of the hybrid photocathode include the use of visible light to drive cathodic fuel-forming reactions in aqueous solutions with no added organic acids or sacrificial chemical reductants. Beiler, et al., Inorg. Chem. MOORE RECEIVES NATIONAL SCIENCE FOUNDATION CAREER AWARD. 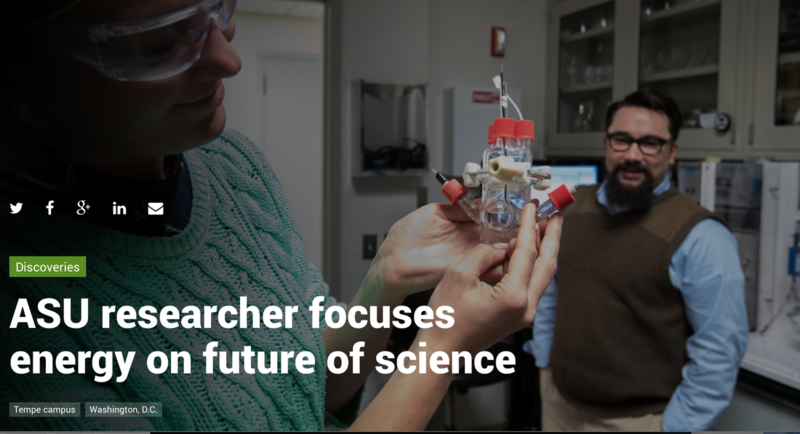 The CAREER award is the National Science Foundation's most prestigious and competitive honor for early-career investigators. CAREER awards support junior faculty who exemplify the role of teacher-scholars through research, education and the integration of education and research within the context of the mission of their organizations. KHUSNUTDINOVA AND COWORKERS PUBLISH IN PHOTOSYNTHETICA. The article is part of a special issue dedicated to Govindjee​​​ and describes the synthesis and characterization of a novel cobalt(II) 5,10,15,20-tetrakis (3-fluorophenyl)porphyrin bearing a 4-vinylphenyl surface attachment group at a beta position on the macrocycle. 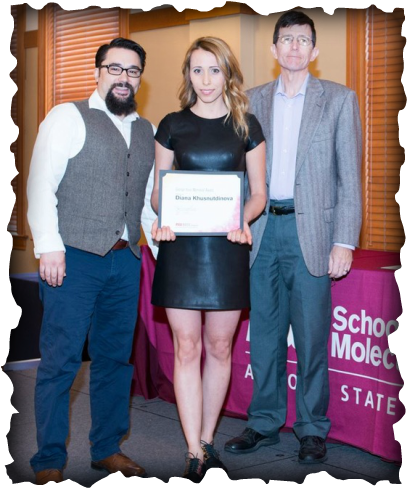 ANNA M. BEILER RECEIVES CLAS GRADUATE EXCELLENCE AWARD AND ARCS FOUNDATION SCHOLORSHIP. 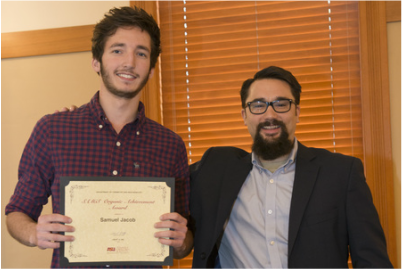 Beiler's thesis research is specifically focused on methods to interface molecular catalysts that can produce fuels, such as hydrogen or reduced forms of carbon dioxide, with visible-light absorbing semiconductors. 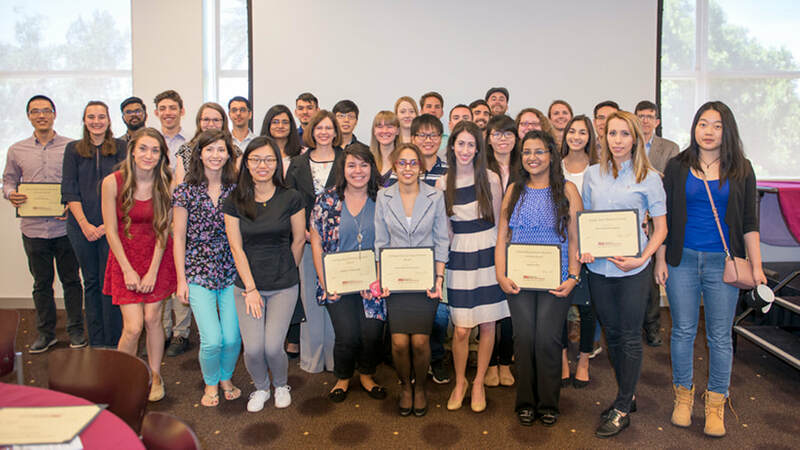 DIANA KHUSNUTDINOVA AND ANNA M. BEILER RECEIVE RECOGNITION AT THE 2017 BIODESIGN FUSION RETREAT. Diana Khusnutdinova was invited to present results form her publication in Chemical Science and Anna. M Beiler received the Marie Curie Award For Best Use of Chemistry. ​WADSWORTH AND COWORKERS PUBLISH IN ACS CATALYSIS, reporting how the unique encapsulating environments of surface-grafted polymeric architectures provide a molecular strategy for improving the chemical stability of surface-immobilized catalysts. Wadsworth, et al., ACS Catal. 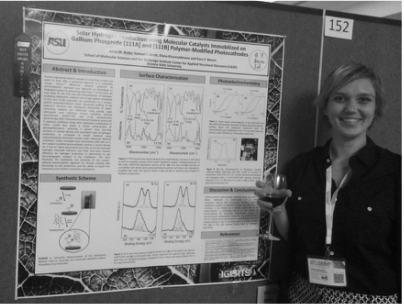 ​ANNA BEILER PARTICIPATES AS A DISCUSSION LEADER IN THE 2016 ELECTRON DONOR ACCEPTOR INTERACTIONS GORDON RESEARCH SYMPOSIUM SESSION: ELECTRON TRANSFER IN MOLECULES AND BEYOND. 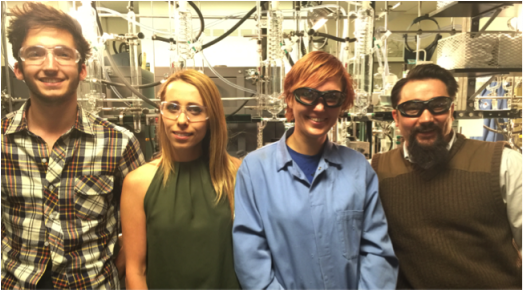 KHUSNUTDINOVA AND COWORKERS PUBLISH IN CHEMICAL SCIENCE. The 'Edge Article' describes a novel synthetic methodology to chemically graft metalloporphyrin catalysts to a visible-light-absorbing semiconductor with the aim of constructing an integrated photocathode for light activating chemical transformations that include converting solar energy to fuels. Characterization of a cobalt-porphyrin based assembly under simulated 1-sun illumination indicate the highest per metal site turnover frequency of hydrogen production reported to date for a molecular-catalyst-modified semiconductor photoelectrode operating at the proton/hydrogen equilibrium potential. Khusnutdinova, et al., Chem. Sci.